The Douglas AIR-2 Genie (previous designation MB-1 and also known as the blivet) was an unguided air-to-air rocket with a 1.5 kt W25 nuclear warhead. It was deployed by the United States Air Force (USAF 1957–1985) and Canada (Royal Canadian Air Force 1965–68, Air Command 1968–84) during the Cold War. Production ended in 1962 after over 3,000 were made, with some related training and test derivatives being produced later. The interception of Soviet strategic bombers was a major military preoccupation of the late 1940s and 1950s. The revelation in 1947 that the Soviet Union had produced a reverse-engineered copy of the Boeing B-29 Superfortress, the Tupolev Tu-4 (NATO reporting name "Bull"), which could reach the continental United States in a one-way attack, followed by the Soviets developing their own atomic bomb in 1949, produced considerable anxiety. The World War II-age fighter armament of machine guns and cannon were inadequate to stop attacks by massed formations of high-speed bombers. Firing large volleys of unguided rockets into bomber formations was not much better, and true air-to-air missiles were in their infancy. In 1954 Douglas Aircraft began a program to investigate the possibility of a nuclear-armed air-to-air weapon. To ensure simplicity and reliability, the weapon would be unguided, since the large blast radius made precise accuracy unnecessary. 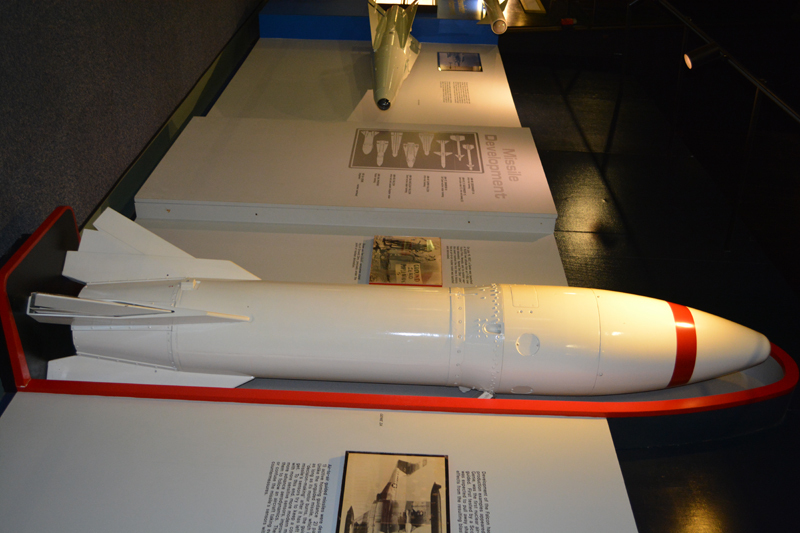 The resultant weapon carried a 1.5-kiloton W25 nuclear warhead and was powered by a Thiokol SR49-TC-1 solid-fuel rocket engine of 162 kN (36,000 lbf) thrust. It had a range of slightly under 10 km (6.2 mi). Targeting, arming, and firing of the weapon were coordinated by the launch aircraft's fire-control system. Detonation was by time-delay fuze, although the fuzing mechanism would not arm the warhead until engine burn-out, to give the launch aircraft sufficient time to turn and escape. Lethal radius of the blast was estimated to be about 300 metres (980 ft).